Can't remember when Junior is due for his next DTaP? Want to know the possible side-effects of the MMR? Wonder whether or not your child really needs the chickenpox vaccine? The answers to these questions could be in the palm of your hand. Rollins researchers Robert Bednarczyk and Saad Omer have developed a new mobile app called ReadyVax that contains up-to-date information about vaccines and vaccination. 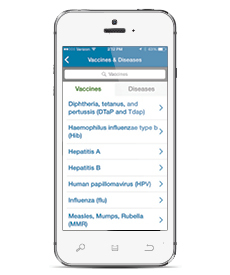 The app, available on iTunes, provides regularly updated data on vaccine recommendations and vaccine safety. It also includes the ability to notify users in real time of important vaccine-related updates. "We wanted to create a single, trusted, go-to vaccine resource," says Bednarczyk, lead developer for the app. "ReadyVax applies to routine vaccine use but is also a helpful resource in case of emergency." ° News alerts and updates about vaccine-preventable diseases and links to available resources. "We have designed the app to be used by both health care providers and consumers," says Omer. "Data presentation can be customized to suit individual information needs."